When the twins had their field trip to the pumpkin patch, I grabbed this shot of the red barn while we were on our hay ride. You may recognize it, as it was featured on my blog last year, with Cort and Reid skulking along in their superhero capes. I'll be sharing a couple more pictures of this same barn in the near future. What can I say? It's fun to photograph! I need to plant some sun flowers next year, I just didn't think about them last season. I used to paint them. The sunflowers looks so much better where you are. We saw some at the pumpkin patch and they were withered and bent. It is very pretty! Sun flowers just bring a smile to my face. :) I think it's a combination of the color and the size. Nice photo! The sunflowers framing the pretty barn makes for a beautiful scene. That's a great shot! The garden of sunflowers is so pretty next to the barn. LOve the sunflowers~!~! The birds well be in happy land with all the sunflower seeds they can eat..
Barns are getting to be rare here in Iowa...I just love them and love to take pictures of them too. Nothing beats a barn for photo ops! What a sweet barn...and I love sunflowers too! I love, love, love the big row of sunflowers in front of the barn. I have been known to snap sunflowers for so long that I almost pass out. To me, they represent all that is good about life! Turn your head up to your giver of life and keep on going!! 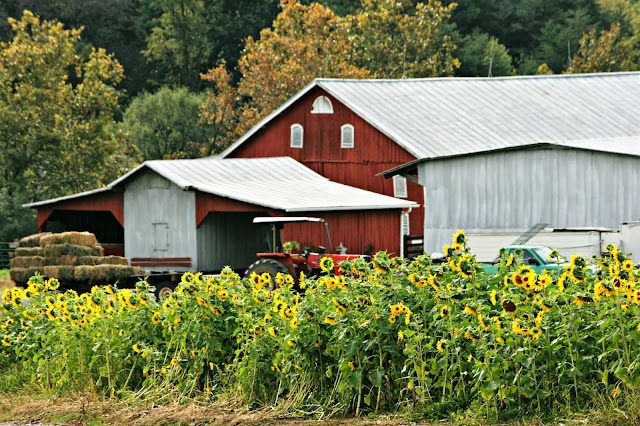 What a perfect photo, two of my favorites....sunflowers and barns! That does look fun to photograph! The colors are awesome together. I like sunflower seeds. You can store them for a long time and they're tasty. Lots of old barns here, mostly abandoned now. I have a fascination of old barns. That photo is great with all the sunflowers in the front. What a wonderful old barn, and it looks so gorgeous hiding behind all of those sunflowers. Bet the boys had alot of fun at the pumpkin patch! Those sunflowers look great with the red barn in the back. That is a really nice, BIG, barn! I love barns. Older barns in particular. I definitely see why you love it so. It's utterly charming. I love sunflowers, too. And these look right at home next to the big red barn. What a lovely photo. Makes me want to go out and look for old buildings to photograph. I love sunflowers. I love this picture.